My local in the 80''s, has been renovated a couple of timings but still looks like a traditional pub in a great location. 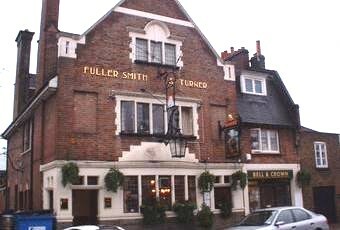 A good offering of Fullers beers both old and new but now concentrating on food - a good number of lunchtime diners. Good selection of beers including a guest from Castle Rock. Pleasant location overlooking the river (inside and out) and close to Kew Bridge train station. After the disappointment of the Bulls Head, this restored my faith in the London boozer. Fair more outside seating. Much quieter with plenty of staff on. The ESB was as good as I have had anywhere. I agree that at 'busy times' and when sun is shining, you will find many well heeled 'Chiswick types' but that is only to be expected. These people do all congregate at the back of pub by the riverside. But I can report that there are plenty of seats nearer the front of the pub. Overall, this is one of the best Thames-side pubs in London. Well worth visiting.